Belkin's N+ Wireless Router features a USB storage port on the back of the router for connecting USB storage devices such as an external hard drive or thumb drive to the network. Now you can centrally store and share media content and files from the USB hard drive to every computer on the network. This router also features Gigabit Ethernet ports for a wired connection that can handle applications that take up a large amount of bandwidth. The N+ router is based on the draft 802.11n 2.0 technology which provides the wireless range to easily cover any-size home or office. The N+ Router has the bandwidth and speed for handling media intensive applications that take up large amounts of your bandwidth. Supports latest 802.11n Draft 2.0 technology for speed up to 300 Mbps. Uses smart MIMO antenna technology for extended range. Features built-in USB port for connecting storage devices. Is backwards compatible with older wireless networks. Connect your desktop or notebook to a network wirelessly at speeds up to 300 Mbps. View larger. Using the latest, 802.11n Draft 2.0 technology, the N+ router offers outstanding range thanks to smart MIMO (multiple-input and multiple-output) technology. This router offers enough range to easily cover most homes or office spaces. With data throughput of up to 300 Mbps, the N+ Router can handle media-intensive applications that take up large amounts of your bandwidth. The router will easily handle high-demand network activity such as streaming music and HD video, playing games online, downloading large files, and making Internet phone calls, all without hiccups or slowdowns. If even this isn't fast enough, the N+ router also has four gigabit Ethernet ports for ultra-fast wired connections. Featuring an elegant and smart vertical design, the N+ Router saves space and looks good on your desk. LED icons let you know at a glance the status of the connection, if security is enabled, if USB storage is being accessed, and other useful information. There's also a "Download Speedmeter" Bar of LEDs that constantly measures the download speed of your network. N+ Wireless Router, quick installation guide, user manual on CD-ROM, power supply, Ethernet cable. There's enough bandwidth for video and music streaming, gaming, and other network heavy applications. Bought this unit to replace a Dell Truemobile 2300 that did not seem to provide the range and user load I needed in a household application. Installation was a breeze for my wired machine and two wireless laptops. However, my son has an older desktop with a Truemobile 1300 USB wireless adapter, and I have yet to get a connection with it. I'm thinking the old 1300 may not support the new encryption. A good looking unit, although a bit large, it also serves as a nightlight. I have it located up near the ceiling in my main downstairs hallway (center of the house), and all the blue lamps do a good job lighting up the area at night. So far this router has been nothing short of spectacular. I have had little to no difficulties. However, if you are using a DSL modem, you will need to call Belkin Tech Support for the mere fact that no instructions are given on what to change the default IP address to and apparently, it is based on the make and model of the DSL modem that one has. Once that is typed in, the router recognized the modem with any delays. Apparently, the CD setup was only designed to run for cable modems. Other downside, no pre-printed manual. The manual is on the CD an one has to etiher print a hardcopy or leave a copy on the hard drive for reference. Other than that..so far so good. Securit is excellent, range is good. No resets as of yet and recognizes other applications (i.e.-external hard drives and wireless devices quite easily). Well worth the price here at Amazon. The same router at BestBuy goes for $119.00 plus tax. With the free super saver shipping, no taxes and what I saved on gas to drive to the nearest BestBuy in my area, it was well worth the wait from Amazon. Works great. Setup was a snap. We have a variety of OS's in the house, XP Vista home, Vista Business. Both 32 & 64 bit processors. All worked great the first time. Seems extremly secure. I tried to hack in, and couldn't. I'm no expert on hacking, but I'm no slouch either. Everyone in the house LOVES the ability to share an external hard drive. All of our music & photos are on there as a backup. OK with N card But!!! Very happy about Amazon's returns process! After searching, researching & waiting on the best deal I was very excited to buy this router. After over 4 hours of starting, restarting, setting up & an hour on the phone with "Tech Support" who were anything but supportive of helpful I was unable to get it to work with my Comcast Broadband service - Comcast's fault according to Belkin. Funny my neighbours Linksys & my old Netgear had no problems. While I'm getting good range and speed with my N laptop and some 802.11b and g devices, my Blackberry Curve 8320 can't even see this router, unless the router is set to it's b/g (no n) compatibility mode. Worse, my Belkin Pre-N equipment can see it, but sees no signal strength, and can't connect, regardless of the compatibility setting. This is a very poor upgrade if you have existing Belkin Pre-N equipment. I'm running my old Pre-N router in access point mode as a work around while I wait to see if a firmware fix comes out for this before the return period expires. Excellent performance for both "g" and "n"
I went shopping for a new router when my network started to overwhelm my old Lynksys router that had been running nonstop for nearly five years. I needed something that would boost signal strength and would take advantage of the "n" cards in two of our laptops. Ours is a somewhat device-heavy household, connected to the router we have a HP MediaSmart home server, a networked laser printer, two desktop PCs, three laptops, three Tivos, a Nintendo Wii, and a Sony Playstation 3. Setup for the router was very easy. The pushbutton setup worked, though I just tried it for fun. For the actual setup I did not use the CD, I just connected to the router through the browser. I am no networking expert, but the explanations of each option are clear and detailed enough for someone with moderate experience like me. I bought this router and the associated USB adapter for my home network. 1. There were no instructions for installing this router from a Linux box (I have Ubuntu). However, I have set these things up MANY, MANY times and I never use the automated setup anyway. But this one did not even offer an IP address to start from. 2. There were no Linux drivers for the USB adapter. That is no big surprise, few manufacturers actually include Linux drivers. However, my Ubuntu would NEVER even recognize the device. (Note: I returned all of this and bought the LinkSys 160NL and the associated USB adapter and Ubuntu AUTOMATICALLY recognized and configured the adapter.) I setup the same laptop on my windows partition and installed the included drivers. The adapter provided a link of 300mbs (compared to the Linksys which only linked at 270mbs). However, the Linksys also gave 270mbs in Linux and the Belkin would not link. 3. The USB storage link does work well with Windows. Both the Belkin and the LinkSys routers CAN be set up and the attached HD can be mounted in Linux but both require a good deal of work and there is no guidance (for Linux) provided by either manufacturer. 4. The Linux problem was enough to force me to send the Belkin router/adapter back. However, I also experienced frequent (every hour or so) dropouts with the router - even using the built-in "G" adapter in my laptop. This was frustrating but it would not have been enough for me to have sent the equipment back. However, with the LinkSys, there are NO dropouts and the connection is rock-solid. There is very little difference in the price or the listed capabilities of the Belkin and LinkSys routers. However, my experience would suggest that the LinkSys is a MUCH better and more stable router. It runs cool while the Belkin got pretty warm to the touch (perhaps the reason it would drop out). Great Router - Easy Set Up ! I bought this Wireless N+ Belkin to replace an older Belkin that physically broke (through no fault of the hardware). 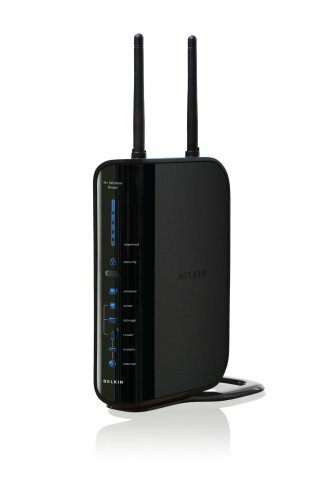 I tried for several days to stop the new Belkin from randomly dropping Internet connectivity on wireless connections to no avail. The outages were for seconds at a time, 5 seconds here or there, but I noticed them frequently enough in web browsing and sending e-mail that I returned the router. I purchased this router to replace an older Belkin router that constantly needed to be restarted. I was hoping that this new router would eliminate that annoyance. I can happily state that since I got it I never had to unplug and replug it in. This is a fantastic router that has not given me a bit of trouble since the day I set it up. I am a huge gamer, both on the PC and Xbox. On other routers you can waste hours figureing out the port forwarding and network settings for your PC games. Every game I have played in the month+ I've had this router has worked without touching a single thing. It's beautiful. The speed of the gigabit switch is mind blowing. I just had an old $36 Netgear router die on me after years of faithful service. I always assumed my cable connection was slow because of all the nodes in my apartment complex. With this router I now get blazing speeds both from my cable internet and between my laptop and media center PC. I have used Netgear and Linksys routers in the past. If this router does have a drawback it is that the web-based control panel is a little clunky compared to other manufacturers. But the beauty is, once you get it set up you don't have to monkey with it constantly like I have had to do with other routers. 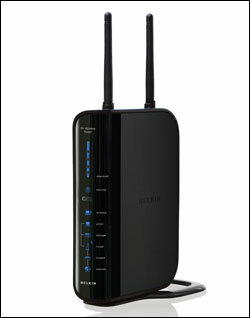 Other reviewers have stated a few difficulties using this router. First, I have Comcast cable internet and it works just fine with this router. Second, I did have some troubles getting the router to see the internet at first. Then I remembered one reviewer's suggestion to start both the cable modem and the router at the same time. After doing that, it locked on and hasn't dropped the connection since.